Bentonville, Ark. 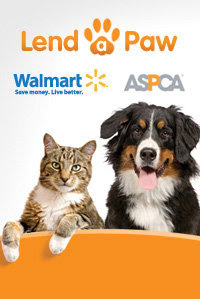 – April 15, 2010 – Walmart and its top pet suppliers are asking Americans to join them in their support for the ASPCA® (American Society for the Prevention of Cruelty to Animals) and its Prevention of Cruelty to Animals Month. Animal lovers everywhere are encouraged to visit www.facebook.com/lendapaw and help “Lend A Paw” to support the ASPCA’s mission to save and improve the lives of millions of animals nationwide. By clicking on the “Create a ‘Lend A Paw’ Post” button, Walmart, through the generous contribution of key pet suppliers, will donate $1 for each post (for a total donation of up to $100,000). All funds raised go to support the ASPCA, the first organization in the Western Hemisphere dedicated to the humane treatment of animals. I'm joining the cause to help our furry friends, won't you?